"Only blood of the rich will stop occupy." The daughter of a prominent New York doctor and her Occupy Wall Street-organizer boyfriend were arrested after police discovered an explosive used for making bombs and a cache of weapons in their upscale New York City apartment, it was claimed. Morgan Gliedman, 27, and Aaron Greene, 31, were taken away from their home in Manhattan&apos;s pricey Greenwich Village on Saturday. The New York Post reports that police found seven grams of HMTD, a high explosive powder that was reportedly used in the 2005 London Underground bombings. Officers discovered bomb-making instructions, including one document titled &apos;The Terrorist Encyclopedia,&apos; according to the newspaper... Greene is an activist with Occupy Wall Street and friends told police his political views are &apos;extreme,&apos; a source told the newspaper. Of the five alleged terrorists who were arrested last week for attempting to blow up a bridge, one was an Occupy Cleveland spokesman and another signed the lease for Occupy Cleveland’s warehouse. "We are pleased these defendants have admitted to their intent to utilize violence, which threatened innocent citizens, to further their ideological views," said FBI Special Agent in Charge Stephen Anthony. Five anarchists were arrested in Cleveland by the FBI for trying to bomb a bridge. Authorities said they had a wish list of other targets, including the Federal Reserve Bank of Cleveland, the Justice Center of Cleveland and another bridge. Two of the arrested — Brandon Baxter and Anthony Hayne — were named in past news reports as leaders of Occupy Cleveland. The five were charged with plotting to bomb a bridge linking two wealthy Cleveland suburbs by placing what they thought were real explosives at the site and repeatedly trying to detonate them using text messages from cellphones, according to the FBI affidavit. The FBI said the suspects bought the explosives — actually fake — from an undercover employee and put them at the base of a highway bridge over the Cuyahoga Valley National Park, about 15 miles south of downtown Cleveland. One of the leaders of the Occupy Cleveland movement, Brandon Baxter, is one of those arrested for today&apos;s terrorist plot to bomb a bridge in Cleveland... Another of today&apos;s suspects is Anthony Hayne, named previously in a report on Occupy Cleveland. “I just want to be very clear: we are not occupying Lakewood,” said Anthony Hayne, who is organizing the information session. Douglas L. Wright, 26, joined alleged co-conspirators Brandon L. Baxter, 20, a.k.a. “Skabby,” and Anthony Hayne, 35, a.k.a. 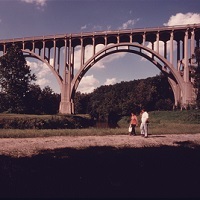 “Tony” and “Billy,” in a plot that authorities say honed in on the Brecksville-Northfield High Level Bridge, which spans the Cuyahoga Valley National Park and carries a four-lane highway. The men have been charged with conspiracy and attempted use of explosive materials to damage physical property affecting interstate commerce. It was at the October 21 OWS event that the informant first met Douglas Wright, 26, who reportedly confided details of his group’s planned attacks “against corporate America and the financial system,” according to court filings... Wright eventually served as the informant’s bridge to the four other men busted in the bombing plot--despite the fact that the quartet was “unsure” about the snitch for whom Wright vouched. Of the five men arrested, four were involved in the Occupy Cleveland movement, according to their Facebook profiles, a news story, and a federal criminal complaint. CLEVELAND - Dozens of members of Occupy Cleveland showed up at a Cleveland courthouse to support the five people charged in connection with an alleged plot to blow up a northeast Ohio bridge. The five suspects -- 21-year-old Connor Stevens, 24-year-old Joshua Stafford (aka “Skully”), 26-year-old Douglas Wright (aka “Cyco), 20-year-old Brandon Baxter (aka “Skabby”) and 37-year-old Anthony Hayne (aka “Tony” & “Billy”) – pleaded not guilty during their arraignment Monday morning. The suspects had the charges -- conspiracy and attempted use of explosive material to damage physical property affecting interstate commerce -- read to them in open court. MIAMI — The last place where their friends in the Occupy Miami movement saw Jared Chase and Brent Vincent Betterly was at an apartment building that authorities here condemned last week, five days before the young men became two of Chicago’s “NATO 3” terror suspects... Cook County authorities say Chase, 27, Betterly, 24, and a third man, 22-year-old Brian Church, met in Fort Lauderdale. The three — now being held on $1.5 million bond each — drove to Chicago last month and planned to firebomb President Obama’s campaign headquarters and Mayor Rahm Emanuel’s North Side home in addition to Chicago police stations and squad cars, authorities charge. Brent Vincent Betterly, one of the three charged with attempting to bomb Chicago during the NATO summit, is an OCCUPY member who was arrested several times in Washington DC’s Occupy camp in McPherson Square. He’s still wanted there per DC Superior Court records. In a piece that must be read to be believed, the radical publication Adbusters, which first suggested the tactic of occupying Wall Street, has now officially endorsed the Black Bloc anarchists as the next phase of the now-flaccid Occupy movement. This endorsement is especially interesting, since many involved with Occupy publicly deny that the Black Bloc is actually affiliated with Occupy. In a one-hour recording of a Friday evening general assembly meeting of the group posted on its website, Occupy leaders expressed concern about Anthony Hayne&apos;s name being on the lease, which strengthens his link to the group. "We have a person facing terrorism charges on the lease of our warehouse," said one of the leaders. "If this gets into the media, it would be a disaster." The privileged daughter of a prominent city doctor, and her boyfriend — a Harvard grad and Occupy Wall Street activist — have been busted for allegedly having a cache of weapons and a bombmaking explosive in their Greenwich Village apartment. Morgan Gliedman — who is nine-months pregnant — and her baby daddy, Aaron Greene, 31, also had instructions on making bombs, including a stack of papers with a cover sheet titled, “The Terrorist Encyclopedia,’’ sources told The Post yesterday... A detective discovered a plastic container with seven grams of a white chemical powder called HMTD, which is so powerful, cops evacuated several nearby buildings. Police also found a flare launcher, which is a commercial replica of a grenade launcher; a modified 12 gauge Mossberg 500 shotgun; ammo; and nine high-capacity rifle magazines, the sources said.